The 501st Legion is Amazing! Making your Blue and Gold Banquet Special. Last weekend was our Blue and Gold Banquet for Scouts. Blue and Gold is an annual banquet that celebrates the birthday of Scouts. Every year we pick a theme, have dinner and all kinds of other stuff. This year I helped head it up and I wanted to go big. It was a lot of work but thanks to an amazing pack, everything went off with no issues. It was so much fun. To start we did a pot luck dinner. Each den was assigned a type of food (such as entrees and sides). We had a parent/son cake decorating contest that also serves double duty for dessert for the evening. The only catch, to enter the contest your dessert has to be done in the theme of the night. This year we did a space theme with the tag line of Scouts helps me reach for the stars! After dinner we had some very special guests stop by. The 501st Legion came and made our event a huge success. If you haven’t heard of the 501st Legion, it is a group of people who dress up as Star Wars characters and attend events, parades, charity functions, and even hospitals to visit sick children. The 501st if made up of all volunteers and they don’t charge for appearances. You can however make a donation to a local charity in their name. Do you know a boy who wouldn’t flip out if he got to hang out with Star Wars characters for the evening? We had a Jedi, 2 Imperial Royal Guards, a Sand Trooper, a Tie-Fighter Pilot and Chewbacca. 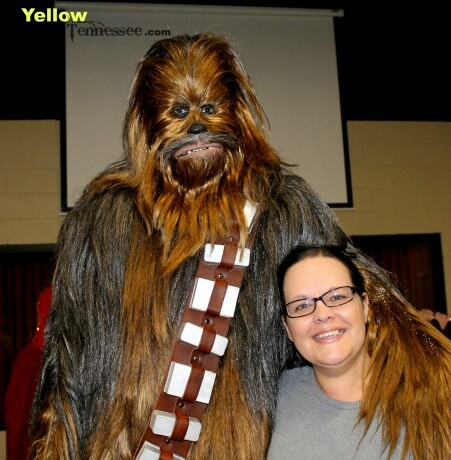 I got to hang out with Chewbacca. Who has the noise down to a science by the way! And also turns out to be a woman in 21 inch stilts under all that hair. But I didn’t tell the boys that. After hanging with our new friends we did awards for the boys. My little man earned his Whittling Chip which is a big deal in 8 year old world and means he can carry and use a pocket knife at camp outs. We ended the night with door prizes that local places donated. We got to give away circus tickets, movie tickets, bowling tickets, and other local events. If you would like any more info on the 501st Legion you can visit their site. From there you can search for groups local to you.